The Vigneshwar temple at Ozar is located at a distance of about 100 km from Pune enroute to Nasik. 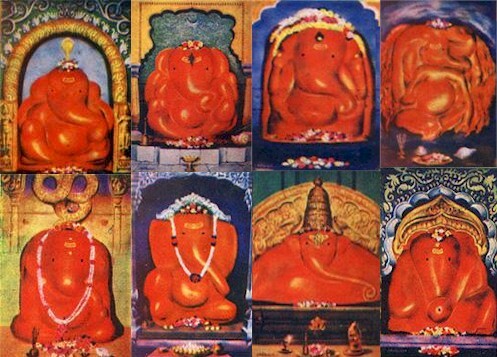 Ozarcha Shri Vigneshwara is considered to be one of the Ashta Vinayak shrines of Maharashtra, celebrating eight instances of legends related to Ganesha. Legend has it that a demon by name Vignaasura created obstacles to every good deed performed by the sages and the other inhabitants of the world. Responding to the pleas of the sages, Ganesha set out to battle the demon Vignaasura who quickly realizing his weakness surrendered to Ganesha, and agreed to stop his misdeeds. He also requested Ganesha to take up the name Vigneshwar in connection with his surrender. Legend also has it that the very same sages installed an image of Vigneshwara at Ozar on Ganesh Chaturti and offered worship. The Temple: An east facing image of Ganesha flanked by his consorts Siddhi and Riddhi is enshrined in this grand temple which has interesting features such as a spacious courtyard, a grand entrance, sculptural and mural work. The image of Ganesha is decorated with precious and semi precious stones.